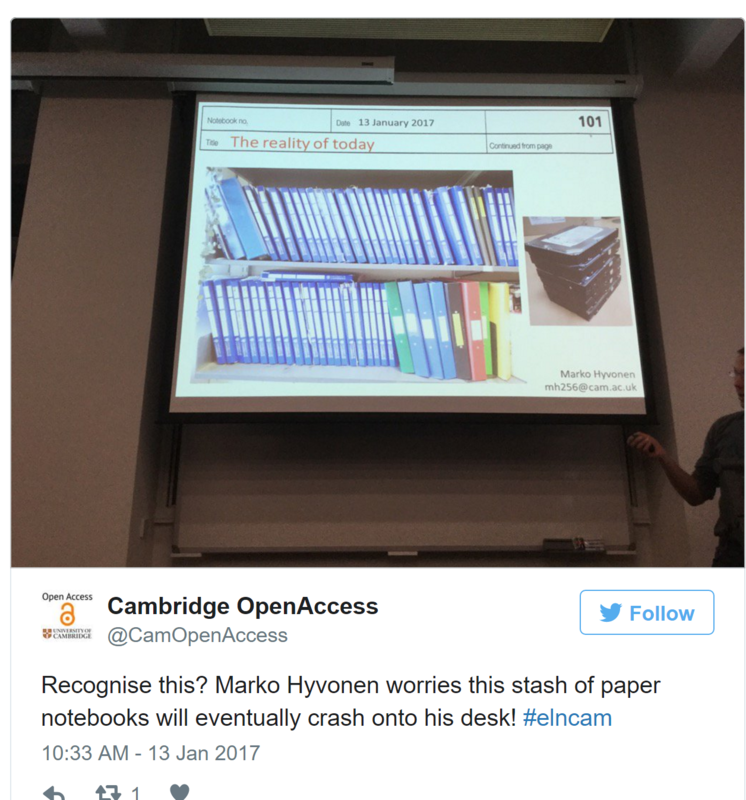 The Office of Scholarly Communication started 2017 with a discussion about ‘going digital’ – on 13 January 2017 we organised an event at Cambridge University’s Department of Engineering to flesh out the problems preventing researchers from implementing Electronic Lab Notebook solutions. Chris Brown from Jisc wrote an excellent blog post with his reflections of the event* and agreed for us to re-blog it here. For researchers working in laboratories the importance of recording experiments, results, workflows, etc in a notebook is engrained into you as a student. However, these paper-based solutions are not ideal when it comes to sharing and preservation. They pile on desks and shelves, vary in quality and often include printed data stuck in. To improve on this situation and resolve many of these issues, e-lab notebooks (ELNs) have been developed. Jisc has been involved in this work through funding projects such as CamELN and LabTrove in the past. Recently, interest in this area has been renewed with the Next Generation Research Environment co-design challenge. On Friday 13 January I attended the E-Lab Notebooks workshop at the University of Cambridge, organised by Office of Scholarly Communication. Its purpose was to open up the discussion about how ELNs are being used in different contexts and formats, and the concerns and motivations for people working in labs. A range of perspectives and experience was given through presentations, group and panel discussions. The audience were mostly from Cambridge, but there was representation from other parts of the UK, as well as Denmark and Germany. A poll at the start showed that the majority of the audience were researchers (57%). The first part of the workshop focussed on the practitioners’ perspective with presentations from the School of Biological Sciences. Alastair Downie (Gurdon Institute) talked about their requirements for an ELN as well as anxieties and risks of adopting a particular system. Research groups currently use a variety of tools, such as Evernote and Dropbox, and often these are trusted more than ELNs. The importance of trust frequently came up during the day. Alastair conducted a survey to gather more detail on the use and requirements of ELNs and received an impressive 345 responses. Cost and complexity were given as the main reasons not to use ELNs. However, when asked for the most important features, cost was less important but ease of use was the most. Researchers want training, voice recognition and remote access. There is clear interest across the school at all levels, but it requires a push with guidance and direction. Marko Hyvönen (Dept of Biochemistry) gave the PI perspective and the issues with an ELN for a biochemical lab. He reinforced what Alastair had said about ELNs. He showed how paper log books pile up, deteriorate over time and sometimes include printed information. They are hard to read and easy to destroy, a poor return on effort, often disappear and not searchable. It was interesting to hear about bad habits such as storing data in non-standardised ways, missing data, printing out Word documents and sticking them into the lab books. With 99% of their data electronic many of the issues in the use of lab books generally are around data management and not ELNs. An ELN solution should be easy to use, cross platform, have a browser front end, be generic/adaptable, allow sharing of data and experiments, enforce Standard Operating Procedures when needed, have templates for standard work to minimise repetition, include inputting of data from phones and other non-specific devices. What they don’t want are the “bells and whistles” features they don’t use. Getting buy-in from people is the top issue to overcome in implementing an ELN. Jan Krause from the École pPolytechnique Fédérale de Lausanne (EPFL) gave a non-UK perspective on ELNs. He described a study, as part of a national RDM project, where they separated ELNs (75 proprietary, 12 open source – 91 features) and Lab Info Management Systems (LIMS) (281 proprietary, 9 open source – 95 features) and compared their features. The two tools used mostly in Switzerland are SLims (commercial solution) and openBIS (homemade tool). To decide which tool to use they undertook a three phase selection process. The first selection was based on disciplinary and technical requirements. The second selection involved detailed analysis based on user requirements (interviews and evaluation weighted by feature) and price. The third selection was tendering and live demos. When using and sharing data you need to make sure your data is safe and secure. Kieren Lovell, from the University Information Services, talked about how researchers should keep their data and accounts safe. Since he started in May 2015, all successful hacks on the university have been due to human error, such as unpatched servers, failures in processes, bad password management, and phishing. Even if you think your data and research isn’t important, the reputational damage of security attacks to the university is huge. He recommended that any research data is shared through cloud providers rather than email, never trust public wifi as is not secure so use Cambridge’s VPN service. If using a local machine you should encrypt your hard drive. In the afternoon, presentations were from the providers’ perspective. Jeremy Frey, from the University of Southampton, talked about his experience of developing an open source ELN to support open and interdisciplinary science. He works on getting the people and technology to work together. It’s not just recording what you have done, you need to include the narrative behind what you do. This is critical for understanding and ELNs are one part of the digital ecosystem in the lab. The solution they’ve developed is LabTrove, partly funded by Jisc, which is a flexible open source web based solution. Allowing pictures to be added to the notes has really helped with accessibility and usability, such as dyslexia. Sustainability, as is often the case, came up and how a community is required to support such a system. It also needs to expand beyond Southampton. Finally, Jeremy used Amazon Echo to query the temperature within part of his lab. He hopes that this will be used more in the lab in the future when it can recognise each researcher’s voice. In the next two presentations, it was over to the vendors to show the advantages of adopting RSpace (by Rory Macneil) and Dotmatics (by Dan Ormsby). The functionality on offer in these types of solutions is attractive for scientists and RSpace showed how it links to most common file stores. With any ELN, it should enhance researchers’ workflow and integrate with the tools they use. Stories of use need to be shared. The PDF is not a great format for sharing. Vendors tell the truth like estate agents. Have to accept the reality that won’t have 100% exporting functionality so need to decide the minimum level. Determine specific users’ requirements. What is the lifetime of an ELN? How long should everything be accessible? Various needs come from group and funder requirements, e.g. 10 years. There is concern if you are relying on one commercial solution as companies can die, so how can you guarantee the data will be available? Have exit policies and support standards and interoperability so data can be moved across ELNs. Broken links and file formats expiring is not just an ELN problem, but relates to the archiving of data in general. Should selection and support of an ELN be at group, department, institution or national level? This is difficult if it’s in one group as adopting any technical solution requires support in place. It requires institutional level support. The biggest hurdle is culture change and showing the benefits of using an ELN. Training and technical support costs money and time. It would cost more initially but becomes more efficient. You can incentivise people by having champions. There are different needs in a large institution. You may join a lab and find the ELN is not adequate. Legal issues around sensitive data complicates matters. You need to believe it will save time. Long term solutions include using cloud base solutions, even MS Office, but what happens when people leave? Need support from higher level. Functionality should be based on user requirements. A start would be to set up a mailing list of people interested in ELNs. Finally, I chaired a panel session with all the presenters. Marta Teperek had kindly asked me to give a short presentation on what Jisc does as many researchers don’t know (in fact I was asked “what’s Jisc?” in the focus group) and to promote the Next Generation Research Environment co-design challenge. Following my presentation the discussion was prompted by questions from the audience and remotely via sli.do. Much of the discussion re-iterated what had been said in the presentations, such as the importance of an ELN that meets the requirements of researchers. It should allow integration with other tools and exporting of the data for use it other ELNs. Getting ELNs used within a department is often difficult so it does need institution level commitment and support. Without this ELNs are unlikely to be adopted within an institution, never mind nationally. One size does not fit all and we should not try to build an ELN that tries to satisfy the different needs of various disciplines. A modular system that integrates with the tools and systems already in use would be a better solution. Much of what was said tallied with the feedback received for the Next Generation Research Environment co-design challenge. Ian Bruno closed the workshop and he reiterated what was said in the panel discussion. I found the event extremely helpful and it provided lots of useful information to feed into the Next Generation Research Environment work. I’d like to thank Marta Teperek for inviting me to chair the panel and for all her hard work putting the event together with @CamOpenData. Marta has put together the tweets from the day into the following storify. All notes and presentations from the event are now published in Apollo, the University of Cambridge’s research repository. 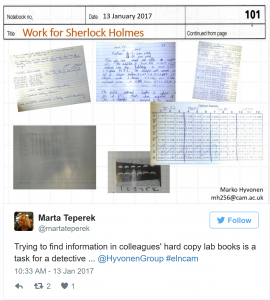 Follow-up actions at the University of Cambridge – give it a go! *Originally published by Jisc on 18 January 2017. I would be curious to know whether these teams are also interested in non-positivist epistemic movements or more generally in digital humanities.